Nearly two weeks ago Athol Steward started his beach trek from Raglan to Whanganui, averaging 30km a day.The Whanganui doctor walking 400km in a bid to stop seabed mining is in his final stretch and is expected to arrive on Castlecliff Beach on Sunday afternoon. The environmental advocate was outraged when Trans-Tasman Resources’ application to extract 50 million tonnes of the South Taranaki Bight seabed every year for 35 years was approved in August. 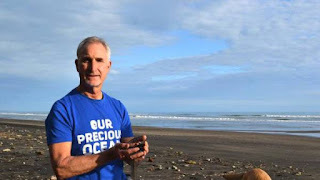 His self-funded mission aimed to support anti-mining group Kiwis Against Seabed Mining (KASM) which filed an appeal against the Environmental Protection Authority decision in the High Court on August 31. Dr Steward said he decided that the time for talking was over and a sausage sizzle and cake sale wasn’t going to do it anymore. And he was right, already he has raised $3695 through his Givealittle page and all proceeds will go towards KASM’s appeal. Dr Steward said he had lots of pleasure fishing and diving out there and it was one of the best fisheries around New Zealand. Walking the first 200km with his eldest son, Lloyd, Dr Steward is now tackling the final 100km with his youngest son, Jonathan. On Friday they will walk Patea to Waipipi then on Saturday they will continue to Waiinu Beach. Gathering as many walkers as they can from Ototoko Beach, Dr Steward plans to end the walk at Castlecliff Beach around 3pm on Sunday.